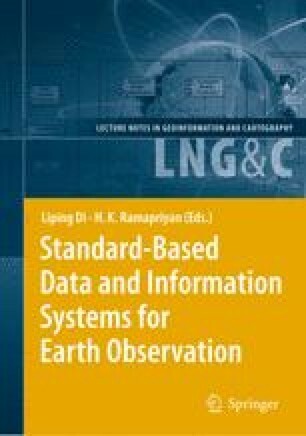 The Open Archival Information System (OAIS) Reference Model was developed by the Consultative Committee for Space Data Systems (CCSDS) in the late 1990s and was adopted as an ISO standard in 2003 (ISO14721:2003) (CCSDS 650.0-B-1, 2002). Recently, many libraries, data centers, and archives around the world have started to adopt this archive model. As a notable example, the National Oceanographic and Atmospheric Administration (NOAA) of the United States of America adopted the model for their Comprehensive Large Array-data Stewardship System (CLASS). CLASS is expected to be the primary repository and access portal for NOAA’s Earth science, satellite-remote-sensing data (http://www.class.noaa.gov/nsaa/products/welcome). Because of the huge scale of these efforts, it is important to carefully consider the manner in which data archives implement the OAIS Reference Model. The specifics of the implementation could impact the preservation and therefore the use and usability of vast quantities of data for many years. Cline, D., Armstrong, R., Davis, R., Elder, K. and Liston, G. 2002, Updated July 2004. CLPX-Ground: ISA snow pit measurements. Edited by M. Parsons and M. J. Brodzik. Boulder, CO: National Snow and Ice Data Center. Digital media. http://www.nsidc.org/data/nsidc-0176.html. Cline, D., Elder, K., Davis, B., Hardy, J., Liston, G.E., Imel, D., Yueh, S.H., et al. 2003. Overview of the NASA cold land processes field experiment (CLPX-2002). In: Microwave Remote Sensing of the Atmosphere and Environment III, 4894:361–372. Hangzhou, China: SPIE, April 30. http://link.aip.org/link/?PSI/4894/361/1. Hall, D. K., Riggs, G. A., and Salomonson, V. V. 2006, updated daily. MODIS/Terra snow cover 5-min L2 swath 500 m V005. Boulder, Colorado USA: National Snow and Ice Data Center. Digital media. http://nsidc.org/data/mod10_l2v5.html. Hoebelheinrich, N., and Banning, J. March 2008, An Investigation into Metadata for Long-Lived Geospatial Data Formats, Library Trends (in press), http://www.digitalpreservation.gov/news/events/ndiipp_meetings/ndiipp08/docs/session7_hoebelheinrich_paper.doc. NASA, Directory Interchange Format (DIF) Writer’s Guide, 2008, Global Change Master Directory. National Aeronautics and Space Administration. http://gcmd.nasa.gov/User/difguide/. NASA, Earth Science Data and Services Directory: Global Change Master Directory Web Site, Global Change Master Directory. National Aeronautics and Space Administration, http://gcmd.nasa.gov/. NSF, August 2003. It’s About Time: Research Challenges in Digital Archiving and Long-Term Preservation, Final Report, Workshop on Research Challenges in Digital Archiving and Long-Term Preservation. Sponsored by the National ScienceFoundation, Digital Government Program and Digital Libraries Program, Directorate for Computing and Information Sciences and Engineering, and the Library of Congress, National Digital Information Infrastructure and Preservation Program, http://www.reference-global.com/doi/pdf/10.1515/MFIR.2004.15.